I have a hard and fast rule about ghost stories and horror novels: I never read them when I'm alone. Although I knew Coraline by Neil Gaiman was in this genre, I figured, "Hey, it's a kid's book. How scary can it be?" Yeah, well, if I had known how much this little book was going to creep me out, I would have made for the nearest crowd be fore daring to open it. As it was, I devoured it while sitting at home, jumping at every tiny sound my 3-year-old made while he was supposed to be napping. The book follows Coraline, a young girl who has just moved into a new flat with her parents. It's not in a traditional apartment building; it's in a "very old house ... [with] an attic under the roof and a cellar under the ground and an overgrown garden with huge old trees in it" (3) that has been subdivided into four living spaces. Since it's summer vacation, Coraline has had ample time to explore the house inside and out. Now, she's bored. Although her parents work from home, they have no time to entertain her. The old house is filled with interesting tenants, and while they provide some amusement, they really aren't very good playmates. So, when Coraline's father hands her a paper and pen and instructs her to "Count all the doors and windows. List everything blue. Mount an expedition to discover the hot water tank. And leave me alone to work" (7), she makes a discovery: a door. Of the fourteen doors in the house, it's the only one that is locked. Coraline's mother shows her where the door leads - only to a brick wall that was erected when the house was subdivided - but Coraline knows there is more to the closet than meets the eye. One day, when her parents are both gone, she unlocks the door and steps into an astonishing new world. Well, it's not new really. In fact, it looks an awful lot like her apartment ... only different somehow. It's inhabited by a couple, who look an awful lot like her parents ... except they aren't ignoring her and they have black buttons instead of eyes. They call themselves her "other" parents. At first, Coraline is excited about her "other" life, where something is always happening and her "other" parents are always available. It's only when she goes back through the door that she realizes the awful truth - her "other" mother has kidnapped her real parents, and will stop at nothing until she possesses Coraline. 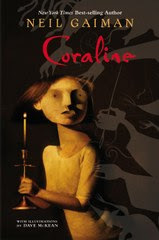 As Coraline searches the "other" world for her parents, she makes another terrible discovery - she's not the only child trapped in the macabre alternate world. When she tries to summon the police, they laugh at her. Coraline knows she is the only one who can find her parents, save the other children and rid them all of the house's cruel menace. All I can say is, read it at your own risk. I thought at first that this was a children's book, but it is actually described as Neil Gaiman's "first novel for all ages" (book flap). That's probably apt, since I think it will scare the snot out of just about anyone. I read this creepy one too!! Great review! I love this book a lot! Well, I love Neil Gaiman too. Hahaha! There's a Coraline movie as well, directed by Henry Selick, the same guy who directed Tim Burton's A Nightmare Before Christmas. I think the trailer's already being shown there in the States if I remember correctly Mr. Gaiman's post in his blog. I really enjoyed this book and am looking forward to the film - I thought Mirrormask was tremendous.